The Rodger Clippo alarm is an excellent day training alarm as it has the ability to be used with just the vibrate funtion which ensures privacy for the user. For night time use, just like the Rodger Wireless alarm, the Rodger Clippo alarm has the choice of 8 different alarm tones, so combines sound with vibration. 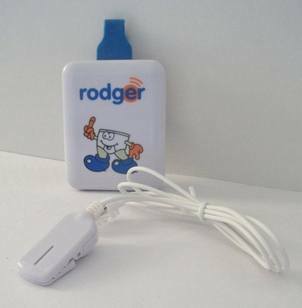 The unique feature of the Rodger Clippo alarm which sets it apart from other wired alarms is the ability to adapt the alarm to use either the clip sensor or the Rodger sensor briefs that are used with the Rodger Wireless alarms. This allows the user and carer to make important choices regarding the use of the alarm. It addresses the self esteem issues that some children have regarding the placement of clip sensors near their 'private' areas. Whilst some children really couldn't care less, others, especially the older users, do find the whole situation rather embarassing and anything that can make the treatment more 'friendly' has got to be a good thing! !